“How to Make a Six-Figure Income Working Part-Time” is a book to help you achieve the ever elusive state of work-life balance. The book explains that there are seven key areas of your life. Many people think that they must get the money first,before they can live their best life. In this book, the exactly opposite approach is described. Although, it may seem counter intuitive, financial abundance will be created as a by product of getting these specific areas of life in alignment. This book is about creating more fun and freedom in your life, by using simple tools and strategies. You can benefit in seven key areas of your life and the information is easy to apply for immediate results. Rebecca Whitman, the author, has synthesized teachings from the leading experts in order to save you time and money in seeking and comprehending this information on your own. “How to Make a Six-Figure Income Working Part-Time” is a fast and easy read. This is not a get rich quick book; or a gimmick to get you to sell no money down real estate; or how to make money working from home. Rather, it is an outline on how to have a happy, successful life. Money isn’t everything in life, until you don’t have it. Money buys freedom and this book teaches you not to be slave to money. But how money can create a happy and fulfilling life. 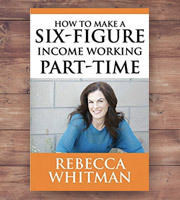 Ms. Whitman has been making a six-figure income working part-time for over a decade. She shares practical advice on how you can apply these same principles to your life. Not many people have all seven areas of their life in balance, but all these areas are interwoven. One small tweak in your approach could be a huge game changer in your lifestyle. The author’s digestible, down to earth approach makes you feel like you are having coffee and getting tips from your closest friend. If you are seeking to feel more empowered in areas of relationships, finances, emotional and physical well being, this book is for you!